The three companies that have won approval are: Ultra Global PRT, skyTran, a company created by the US space agency Nasa, and Metrino PRT, which has formed joint ventures with Indian companies. New Delhi: A NITI Aayog panel has cleared a government proposal to test three rapid transport systems using pod cars—futuristic, driverless vehicles that run along a pre-determined course. The approval to the project proposed by the ministry of road transport and highways comes as a shot in the arm for global transport technology giants trying to enter India. However, Ultra is the only company whose technology has been tested and is in commercial use. 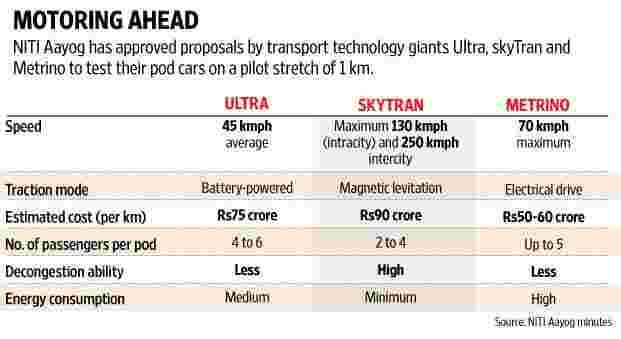 The pod vehicles of Ultra are made of steel with rubber tyres that run on specially made tracks, while those of skyTran are magnetically levitated and Metrino pods are suspended from overhead rails. The approval was given by a committee headed by NITI Aayog member V.K. Saraswat and comprised experts from railways, road transport and urban development ministries after the three companies made presentations. According to minutes of the panel meeting reviewed by Mint, the NITI Aayog said: “These new technologies should be tried on a pilot stretch of about 1km length on different stretches. However, for the pilot project of about 1km, the bidders will execute the work/testing at their own risk and cost." “The stretches selected should be such that each one of them can be further extended to a reasonable length of 15-20km so that if the technology is successful in pilot stretch, it should be extended to further adjoining length ensuring safety during trial runs," the minutes said. ALSO READ | Can Hyperloop transform how Indians travel? The expert committee observed that the per passenger km energy consumed by such systems is much lower than other modes of transport. A NITI Aayog official said on condition of anonymity that Ultra is the only one among the three whose technology has been put to commercial use at present. “It is working at Heathrow Airport in London and that too on a speed of only 45 km per hour, while we are expecting a speed of 75 km per hour." The skyTran technology is at the testing stage while Metrino has developed a prototype that was tested in 2007 in Poland but which is yet to be commercially operated or tested. The official said all the technologies cost less than Rs100 crore per km. A senior transport ministry official requesting anonymity confirmed the decision. “The projects don’t include any intensive construction activities and has zero negative environment impact such as air and noise pollution," the official said. The official added that the decision on the implementing agency—whether it would be the road ministry or National Highway Authority of India (NHAI)—is yet to be taken. However, the official was sceptical over whether a company would be interested to make investments to showcase their technology.